Switchgrass, Panicum virgatum, is a warm season grass native to the United States. There are ornamental forms for garden use. I'm referring to the straight species. When the garden club went to Snyder Research Farm to pick apples (for ourselves and for a food bank) Geoff showed us a couple of trial plots of switch grass. It grows well on marginal land unsuitable for row crops, needs little fertilizer. And mentioned a farm in Wapwallopen, Pennsylvania that's growing it. Among other products, turns it into pelleted fuel. I found a nice Youtube video. Enjoy. 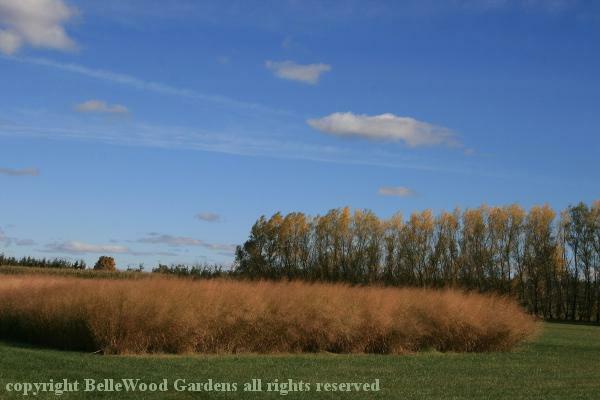 For real fun, check out Miscanthus giganteus as well! Incredibly tall growing sterile hybrid. Getting used more frequently as bedding for bedded pack barns, as well as for biomass energy. but it's definitely not a common crop up here. Perhaps more so in the future as more institutions switch to biomass boilers for their heating plants and wood chips become more scarce. I've seen quite a few fields of Miscanthum here in Cambridgeshire. I have assumed it was for biofuel. Why would woodchip become more scarce Slim? Any wood can be used for it, and it is often just left as a way of getting rid of thinnings. Do you have some rules about its use or production where you are? If there is spare land and it doesn't need fertiliser, grass seems a good option for biofuel. What doesn't seem a good idea is taking land out of food production if the food is needed. Not much use being able to transport and cook non-existent food. Surely if this grass i sterile hybred then will contine to line a seed companies pockets and make it impossible collect ones one seed. Strangle hold leading problems in the future. Not a good or safe future for the environment. I don't think being a sterile hybrid necessarily causes problems with supply. After all, as far as I am aware, the farmers round here don't save their own seed for wheat, OSR, onions etc.. Mind you that might be a problem, but not one I have heard talked about. Both Panicum virgatum and Miscanthus giganteum are perennial. The Panicum is raised from seed, takes a couple of years to establish, and is then cut once a year. I thought the idea of leaving it through the winter (wildlife shelter) sounded good, plus cutting in early spring before growth would suggest it is drier than cutting while green. In the video the grower / farmer said that this also means nutrients go back into the ground. I have one plant of M. giganteum as an ornamental. Name is well deserved - once established it grows maybe 10 feet tall each year. I cut it down in spring for appearances. To cultivate a field of it I imagine it would be sprigged and planted out. Sort of like zoysia if anyone uses that for a lawn / turf grass. The drawback - besides expense of plugs vs seed - is that the Miscanthus needs better soil and more nutrients than the Panicum. Given its size my expectation is that it takes bigger equipment to harvest and chop, plus cut green it takes more energy to dry to make pellets. If you want a giggle, look for Youtube videos of making paper / sawdust "pucks" for fuel. Make a slurry of any and all waste paper except the shiny stuff, maybe add sawdust, compress in a form and then air dry. There's an Australian using a piece of smallish diameter PVC pipe in a caulking gun frame. Seems small return for the effort. An Irishman who keeps mentioning that in his climate it is difficult to dry the pucks. Americans who form them in a 5 gallon plastic bucket with holes drilled in the bottom and slightly up the sides. They mention that since you cannot just drop a match on the dried puck to light it, the puck must be chopped up "like firewood." If the grasses are perennial the advantage of a sterile hybrid is that it won't spread as easily as one producing seed, not will it cross fertilise local grasses. Why can't excess straw from cereal crops be used instead? I know the stems are a lot harder, but chopped up fine and treated as pellets, perhaps mixed with grass or other stuff to bind, with the pressure they apply, it ought to work. That way you get two crops from one bit of land. There was a fashion for various ways of using paper for firewood here a few years ago Jam Lady. It died a death as; 1. some newspapers (like our local one) are made of flame retardant paper, 2. it is hard work for not much return, 3. they are a brute to dry. When I lodged on a farm, the farmer had a bale burner built on the side of the house - this was in the late 1970s. Basically an enormous stove. He burnt 'standard ' rectanglar bales of straw in it. I think it used to heat the hot water (there were no radiators at that time in the house). I've no idea how efficient it was, but of course he had any number of bales to burn. In later years these straw burners were available for the big round bales ,and now are capable of supplying heat for water and central heating. Thanks Ty Gwyn. I was aware of the bale burning stoves, but a number of those have been removed as there were problems with some of the earlier ones; think they burned the straw incompletely or something and produced something like smuts or excess pollution from the chimney. Glad to see straw is being used. I didn't see why it couldn't be as wood chip is. Could`nt find any source making straw pellets in the UK,but we are in a different situation to the Baltic states,as in we have larger numbers of livestock who consume large amounts of straw each year,fed straight,mixed in feeds when chopped and bedding,plus on the East Coast is consumed in power stations,plus farmers growing short straw crops chop on the field and plough in,sometimes the only organic matter their land gets. Folks already dispute how much timber should be harvested from the woodlands here, with a fair amount designated as wilderness (I think that's the designation with no real harvesting ever taking place). The concept of "thinnings" in the woodland is an interesting one, as I'm guessing you are perhaps describing a more intensive style of management than most of our woodlands receive. No one really coppices here that I know of. People go in to the woods to harvest valuable hardwoods, often for furniture. Some softwoods are taken for lumber, and less valuable (or just younger) hardwoods are taken for cordwood. There are some large areas that are used as pulpwood for the paper industry, though I don't think it's the thriving industry it once was, and a lot has reverted to unmanaged woodland (not sure about that one). I was just talking to a composter that was saying wood chips have gone from pretty much free to an input with a rising cost, because of the demand for energy generation and heating. Everything in the UK is more intensively managed than yours I think Slim as we have a far smaller area of land per head of population. One of the problems we have here is that so much woodland is uneconomic to manage as it is split up into lots of small woods. This has resulted in loss of habitat for woodland flowers, insects, bats and birds. There is talk of 'rewilding' certain areas, but not sure it will be a major advantage to anything including wildlife. I didn't think I had heard much about straw pellets Ty Gwyn. I didn't realise straw was used so extensively in farming; only as animal bedding. Here they take the straw off and just plough in the stubble or drill direct leaving the stubble to bind the soil.